This exceptional antique George III sterling silver teapot has a plain oval rounded form onto a collet style foot. 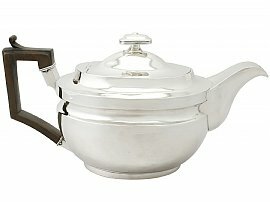 The plain surface of this large silver teapot is embellished with a concave channel. This fine Georgian teapot is fitted with a plain domed flush hinged hallmarked cover which retains the original sterling silver rounded rectangular finial, securing to the interior with a wing nut; the flush hinge indicates the fine quality of the piece. The teapot retains the original angular carved pear wood handle with a plain scrolling thumbpiece and faceted sterling silver sockets. This antique teapot has an impressive plain flat topped swan necked spout with a lobed pouring hole to the lip. This antique teapot is an exceptional gauge of silver, exceptional quality and in exceptional presentation condition, in keeping with age. There are a few natural fire marks to the surface of the teapot, in keeping with age. Length from back of handle to tip of spout 30.5cm/12"
Height to top of thumbpiece 15.5cm/6.1"